Click here to view the full album on Flickr. Please note that the audience stands for the duration of the performance (approximately 50 minutes). See a video of excerpts of A Body in Places performances. Dancer/choreographer Eiko Otake, Visiting Artist in Dance and East Asian Studies, presents a series of intimate performances throughout the fall. Her first solo project A Body in Places began with A Body in a Station, performed in 2014 in the waiting room of Philadelphia’s 30th Street Station; and continued at Wesleyan in 2015 with her performance A Body in a Library at Olin Library and the photography exhibition A Body In Fukushima. Her project continues with performances at Middletown’s Russell Library, and at Wesleyan’s Alsop House and Van Vleck Observatory (commissioned in honor of the building’s 100th anniversary celebration). In this dance of solitude and fragility, Eiko explores the characteristics of each specific place and exchange an intimate gaze with each viewer. Audience members are welcome to stay and speak with the artist. The Russell Library and Van Vleck Observatory performances are general admission and first-come, first-served. For the Alsop House performances, reserved seating is extremely limited, and is available for up to 10 audience members for each performance. Please call the Wesleyan University Box Office at 860-685-3355 to reserve a seat. Sponsored by the Center for the Arts. Co-sponsored by the Van Vleck Observatory’s 100th Anniversary Committee. Made possible by a grant from the National Dance Project of the New England Foundation for the Arts, and The Andrew W. Mellon Foundation. 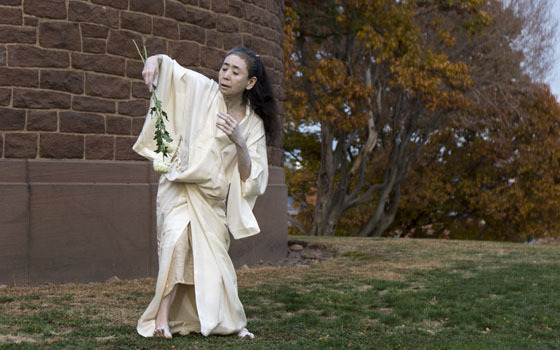 Image of Eiko Otake by William Johnston.